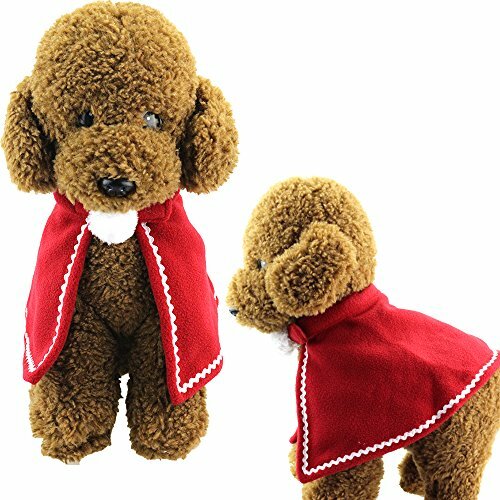 Adorable and festive Christmas Santa Claus cloak and hat, make your pet more attractive and cuter. Great and wonderful for Christmas family gathering, party, photo taking, play date, etc. 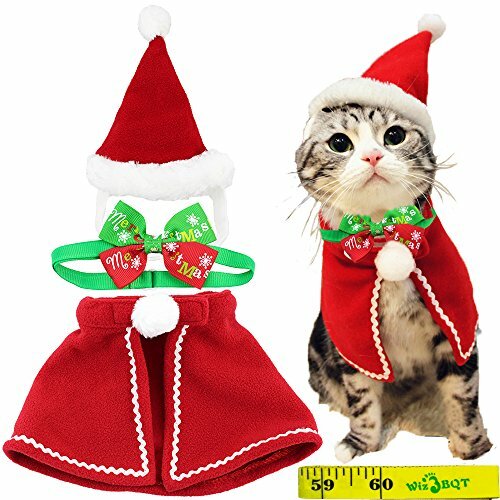 Made of soft material, it’s comfortable for your pet to wear them. Adjustable by velcro, easy on and off. 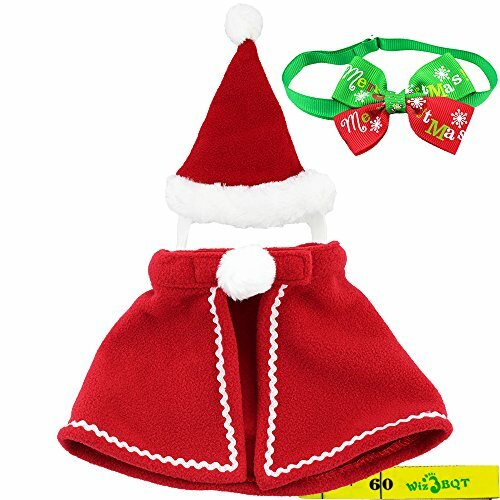 These pet Santa hat and cloak, and bow tie collar are adorable, festive and soft. 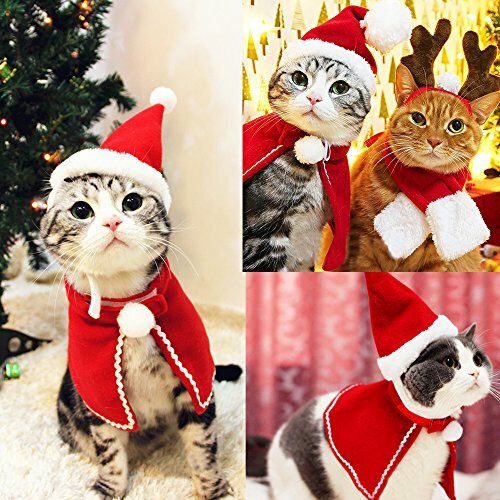 This set will make your pet more attractive and cuter at Christmas season. It’s great and wonderful for Christmas family gathering, party, photo taking, play date, etc. It will help to draw lots of attention and win lots of compliments. 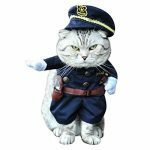 It’s a great and wonderful Christmas gift for your pet. The hat and cloak are made of soft material. It’s comfortable for your pet to wear it. Size A—Cloak Neck Girth: about 9.8″/25cm, Cloak Back Length: 5.1″/13cm. 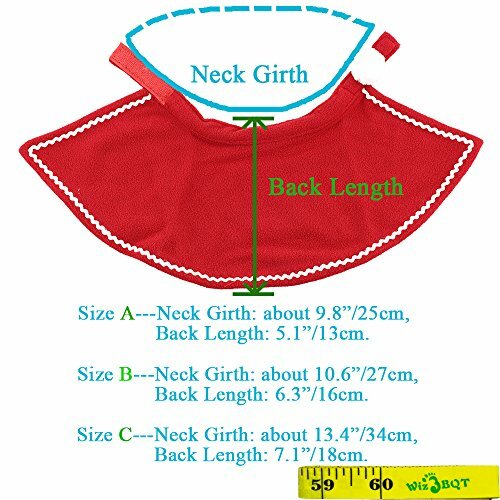 Size B—Cloak Neck Girth: about 10.6″/27cm, Cloak Back Length: 6.3″/16cm. Size C—Cloak Neck Girth: about 13.4″/34cm, Cloak Back Length: 7.1″/18cm. Hat Height: 16cm/6.3″, Hat Bottom Diameter: 10cm/3.9″, Hat Chin Strap Girth: 28-33cm/11″-13″. Bow Tie Collar Girth: 20-36 cm/ 7.8-14.1″. Bow Tie: 5*7cm/ 1.9*2.7″. You’ll also receive a bonus of Wiz BBQT tape. It can help to record the growing of your pet. Also, it’s a good helper while you shop online. Please check your package and make sure you receive the tape. 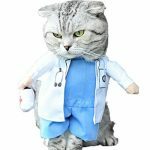 Bonus Wiz BBQT measuring tape: help to record the growing of your pet.